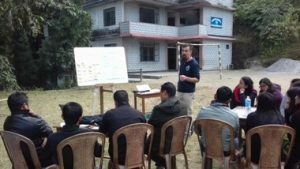 By Mark Adams – Mondo Volunteer working for 9 months in the Mondo Schools Kalimpong & Darjeeling. 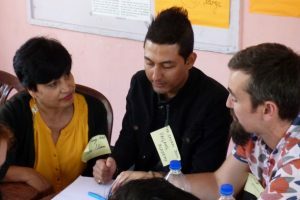 Mark (right) with some of the teachers in Mondo schools. I arrived in India full of anticipation and excitement. 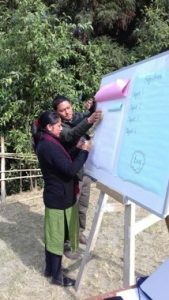 Embarking upon a seven-month stint as a volunteer with rural schools in the northern most part of West Bengal, I was keen and enthusiastic. A practical, creative teacher, I wanted to find out what lessons I could learn and how I might be of assistance to the schools within this completely different community. 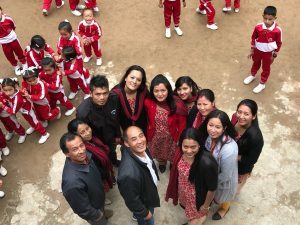 Having focused for nine years on teaching 4-6 years olds through play-based activities, I was acutely aware of the challenges I might face working in a country that has always adopted a ‘by rote’ approach to education. The journey has been fascinating. It quickly became very apparent just how different the system is, and I took my time observing and discussing current teaching methods, whilst also assimilating to the very alien environment I found myself in. At the start, I wanted to ensure that any interventions, suggestions or support I offered took account of as much of the local situation as possible. They had to be relevant. 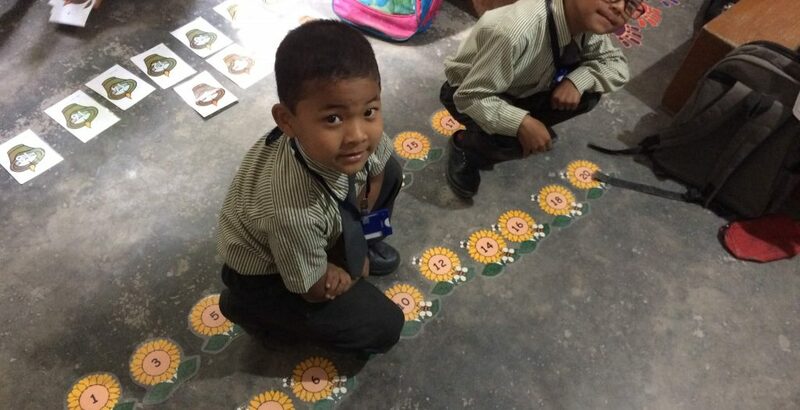 It is clear there are a number of issues that directly affect the notion of introducing rural, Indian schools to a more practical, vibrant and interactive way of teaching. These issues do not preclude, entirely, the possibility of a compromise, whereby the best of both worlds can be merged, but the road is bumpy and full of twists and turns. 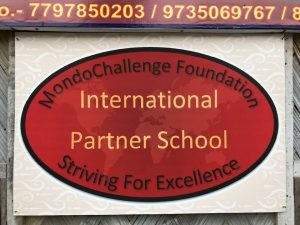 There are thirteen schools in the area of India I am working. All unique, all different, with varying numbers of students. But, on entering the schools there is one very apparent link and that is the teacher-led style of education. Often standing at the front of the class, text book in hand, the majority of lessons are conducted from that position. Children recite, read and answer questions in unison. There is little room for individuality or creatively putting answers into their own words. This stark contrast from the style of teaching I am used to, sharply focuses the mind and it requires considerable thought as to how to even begin. It is fair to say that I do not entirely discount the more ‘by rote’ system of education. For some children it clearly works. As a country, India are very successful in technology, pharmaceutical and medical practises. My grandparents, who experienced what we might call a ‘Victorian’ style of education in the UK, were two of the most independent, intelligent and resourceful people I have known. But, it is also fair to say that a ‘by rote’ system excludes a vast number of children that do not learn in that one, very auditory dependent, method of teaching. It is these children, that end up in low skilled jobs, who, when given different opportunities to access learning, could themselves excel. Resources are a large barrier to making classrooms more engaging for children in this part of India. We, in the UK, should count ourselves lucky. The number of times I have moaned about a paper shortage or a printer without ink or the lack of paint is shameful. 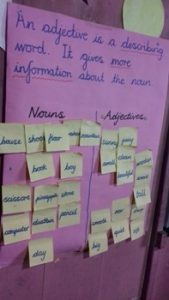 The teachers here could look to their natural environment for practical resources to use in lessons, but many rely on the printed text and instructions in front of them. Consequently, due to the reliance upon textbooks and copy, there is little work on the walls and, in some schools, no displayed evidence of children’s work whatsoever. There are, however, stark signs of hope. 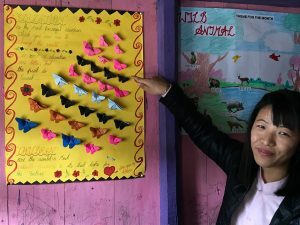 In one small town, perched on the very top of a ridge over 2000 metres above sea level, a primary school of 112 children is festooned with colourful posters and artwork. The creative, female head teacher encourages her staff to promote the children’s work through visual means – a key element in learning. One village I have been based in recently has had electricity only since 1999. It continues to cut out approximately once a day. Their first computer arrived in 2014. They have no Wifi and have had little to no training on how to use a computer. With no local support to develop this in many of the schools and a shortage of relevantly experienced volunteers, it is easy to see why teachers are frustrated and resort to more established methods of teaching. 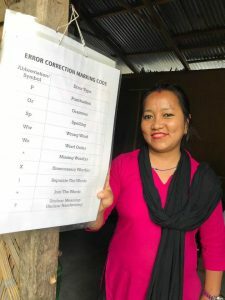 In a wider context, it is important to remember that only a few of the teachers in this incredibly beautiful part of India, nestled in the foothills of the Himalayas, have received any formal teacher training at all. The more proactive teachers, who want to learn and develop their skills are often up against ‘old school’ head teachers who are to be respected and, in short, obeyed. Another difficulty is time. There is not a teacher I know anywhere who would not love to have more time, but here the fact is that teaching is unlikely to be a person’s only job. With very low salaries, teachers often need to find other ways of bringing in money. One teacher I know is an emergency overnight ambulance driver, decorates wedding halls, has 4 lodgers he tutors and, as with most families here, has some kind of small holding. Time to spend adding creativity to lessons is in short supply. The school buildings are, on the whole, small, cold, with interconnecting classrooms of different age groups that make moving around, or creativity difficult without disturbing other lessons. With challenges like these, bringing a more engaging, interactive way of teaching can seem like too much of a mountain to tackle. 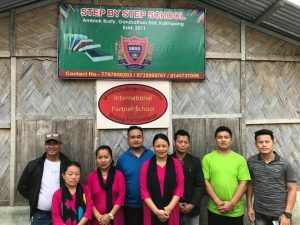 But, dwelling in the shadow of Mount Kanchenjunga, the third tallest mountain in the world, clearly provides inspiration abound as there has been a huge level of support and interest in how to make lessons more engaging for children. Having started training staff at each of the thirteen schools, their ideas on how to make lessons interactive are on point. A little rudimentary maybe, they have strong foundations for development and, over time, experience will give them the confidence to pursue even more creative ways of engagement. Model lessons and photos of interactive learning situations support the notions and ideas the training supplies. In a country where pleasing people comes before questioning, there has been a surprising amount of dialogue. With commitment like this it can only get better. The barriers will remain and perhaps biggest of all is how to ensure the learning remains relevant for an exam-based system where a large percentage of the questions are from text books used over the year, which children use to memorise specific answers which they can then regurgitate in written form on their answer paper. The compromise is there, it will just take a little time to find the right balance. So, for my remaining time here, supporting teachers and Heads with practical suggestions and examples of how to adapt textbook lessons into learning that is visual, auditory and kinaesthetic has to be a priority. That, and continuing to experience the overwhelmingly friendly, welcoming and kind hospitality of this wonderful community.